The Hughes Electric Heating Company was founded in Chicago by George A. Hughes (1871-1944), the founder of an electric light and power company in Fargo, ND. He introduced the first "electric cook stove" at the National Electric Light Association convention in St. Louis M0 in 1910. Hughes had been developing earlier crude test models since 1904. He began producing refined models in 1909 with three burners and an oven, after he sold his interest in the power company. This stove was the first to integrate ate burners and oven into a single, free-standing major appliance. Earlier "cooking tables" merely incorporated a series of electrical receptacles into which individual electric appliances could be plugged. 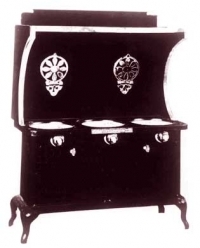 General Electric introduced such a cooking table in 1905, which included a separate oven. By 1907, GE had a full line of heating and cooking appliances and in 1912, began production of its Model R-1 free standing range. In 1916, Hughes hired Bernice Lowen and Helen Aitken to establish a Home Economics Department, which set a precedent in the home appliance industry. In 1918 Hughes' company merged with the Hotpoint Electric Heating Company and the heating device section of General Electric to form the Edison Electric Appliance Company, and to produce Hotpoint brand name products. Hughes was its first president. Hotpoint was the name Earl H. Richardson gave in 1907 to an electric iron he introduced in 1905 which became the first commercially successful electric laundry iron. It concentrated heat at its point (easier to iron around buttons and pleats), was smaller and lighter than competitors, and was the first to feature a heel stand and a detachable cord. By 1912, the company, originally named the Pacific Electric Heating Company, was re-named as Hotpoint Electric Heating Company, and had a complete line of home appliances. The Hotpoint trademark was registered in 1914. The first Hotpoint electric range, Model 1, was produced in 1919. Until 1922, all electric ranges were produced in black or brown, with white enamel oven door panels. Hotpoint this year received an order from a Raleigh, NC utility executive for an all-white, porcelain stove. Rather than admit that such a stove was not being produced, Hotpoint quoted a very high price to discourage him. Upon receiving an order anyway, they had to develop a new annealing process to apply the enamel. So 1923 models included white range with nickel trim on the door, and white subsequently became widely accepted in the industry. In 1931, the Edison Electric Appliance Company became the Edison General al Electric Company and in 1934, General Electric and Hotpoint brand production was consolidated.